You've probably never tasted anything quite like Lester's Fixins Food Sodas. These unique gourmet beverages are crafted to taste exactly like popular foods such as bacon and sweet corn! 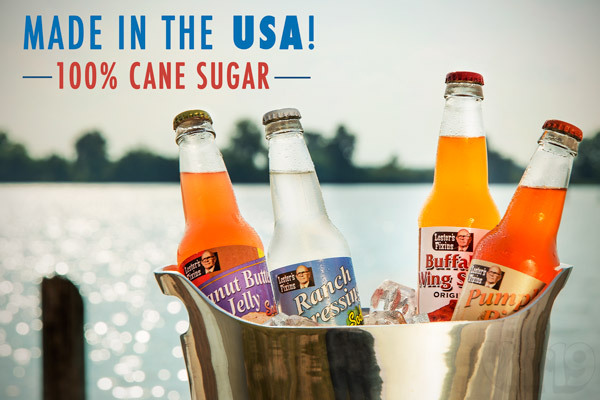 Made in the USA with 100% cane sugar, Lester's Food Sodas are a carbonated taste adventure. Choose from a variety of savory, sweet, tangy, and spicy flavors including Ranch Dressing, Pumpkin Pie, Peanut Butter & Jelly, Buffalo Wing, Bacon, and Sweet Corn! Wash that food down with some more food (soda)! Lester is an amazing guy. 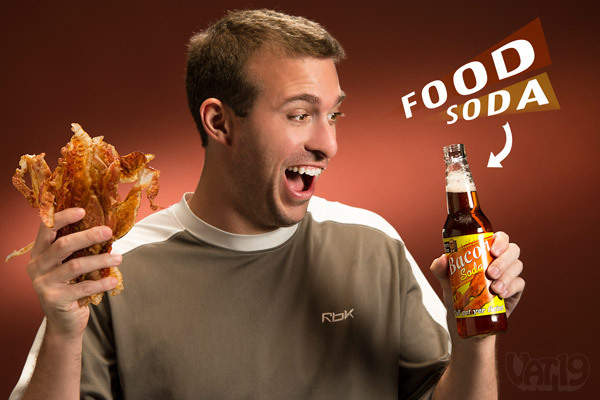 He's obsessed with unique and flavorful soda, and one day, he hit upon the idea of creating a bacon-flavored drink. At first, people thought he was crazy. Then they realized that he's crazy like a fox! 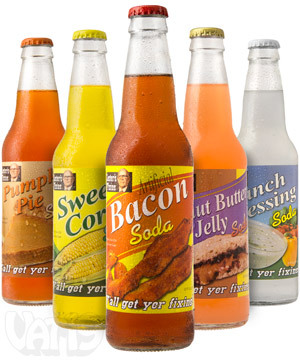 Lester's Fixins Food Sodas are so outrageous that you simply have to try them. And because Lester is such a perfectionist, he has ensured that there's simply no mistaking these sodas for anything other than the liquid equivalent of its food namesake. 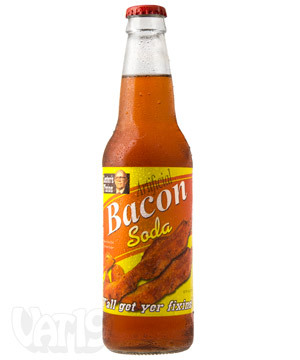 Basically, bacon soda tastes just like bacon! Sweet corn soda tastes like sweet corn and, you guessed it, peanut butter & jelly soda tastes like a PB&J sammie. 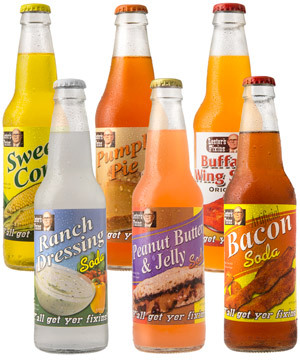 Lester's Fixins are gourmet sodas featuring unique food flavors! It's like drinking your dinner... but in a good way! Lester's Food Sodas have each been painstakingly designed to taste as close as possible to their namesakes. Sweet Corn? Yes! It tastes just like a mouthful of farm-fresh sweet corn. Jamie, the evil boss of Vat19.com, personally tasted each soda to ensure authenticity prior to deciding to sell them on the site. He joyfully reenacted his taste test for the image below! There is zero ambiguity in Lester's Food Sodas. They taste exactly like their names imply. Lester's Fixins Food Sodas are made right here in the good ol' US-of-A. Just like Jelly Belly Soda, they are made using 100% cane sugar as opposed to high fructose corn syrup. We think that cane sugar is better-tasting than HFCS. It's also a naturally occurring substance whereas HFCS is man-made. But, frankly, that's all beside the point. These sodas taste like food! Enjoy the rich and complex flavors of Lester's american-made food sodas. Choose from six "yes that's really a soda" flavors! 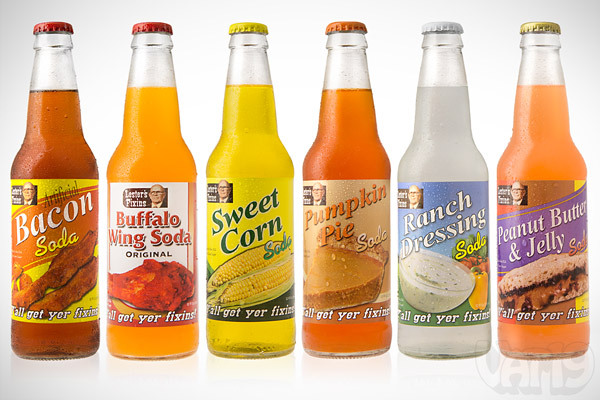 Lester's Food Sodas are currently available in the following flavors: Bacon, Buffalo Wing, Sweet Corn, Pumpkin Pie, Ranch Dressing, and PB&J. Yes, yes, yes, yes, yes! They taste exactly like their corresponding food. You simply have to try them. Lester's Fixins are currently available in a wide variety of tasty food flavors. Question: Won't these taste disgusting? 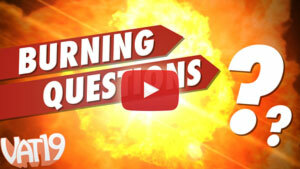 Answer: That's what we thought at first. But, it turns out that liquified versions of these popular foods taste a lot better than one would think! 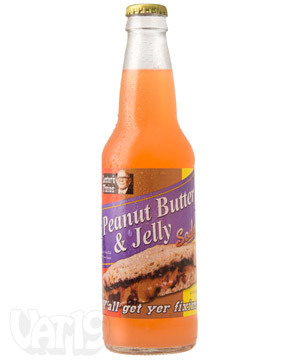 It's hard to explain unless you experience it, but when you drink Peanut Butter & Jelly Soda, it really seems like there's creamy peanut butter on the roof of your mouth. The bottom line is that these are definitely unique flavors. It takes a bit of "experience" to get used to a carbonated beverage tasting like sweet corn. But, we're supremely confident that you'll enjoy the experience. 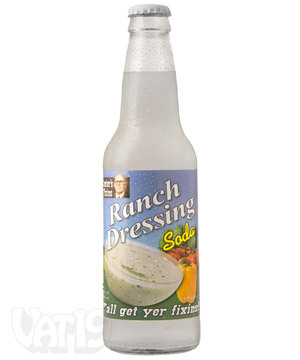 Question: Seriously, ranch dressing soda? Question: Level with me. They're nasty, right? "My favorite was the PB&J. For some reason, the peanut butter came through so vividly. It really seemed like some was stuck to the roof of my mouth. The Pumpkin Pie was amazing. It's probably the best tasting. The Bacon Soda was thrilling because it's such an odd flavor to drink. But, it worked. Sweet Corn had a great after taste. It actually tasted better after a few seconds. 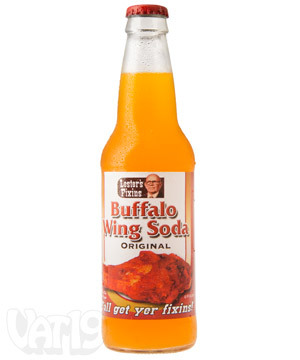 The Buffalo Wing Soda was spicy which was definitely an interesting sensation to get from a soda. Ranch Dressing was probably the craziest. I'm not a huge fan of ranch on a salad, but I didn't hate the soda. Fans of ranch, however, would probably enjoy this one." Question: What are the ingredients? Bacon Carbonated water, sugar, citric acid, sodium benzoate (preservative), caramel color, natural flavor, red 40. Buffalo Wing Soda Carbonated water, sugar, citric acid, sodium benzoate (preservative), ester gum, natural flavor, yellow 6, caramel color, red 40. Peanut Butter & Jelly Carbonated water, sugar, citric acid, sodium benzoate (preservative), modified food starch, natural & artificial flavor, yellow 5, red 40, blue 1. 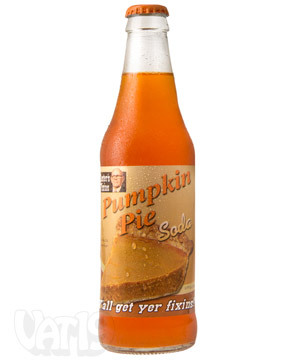 Pumpkin Pie Carbonated water, sugar, citric acid, sodium benzoate (preservative), natural & artificial flavors, modified food starch, ester gum, caramel color, yellow 6, red 40. 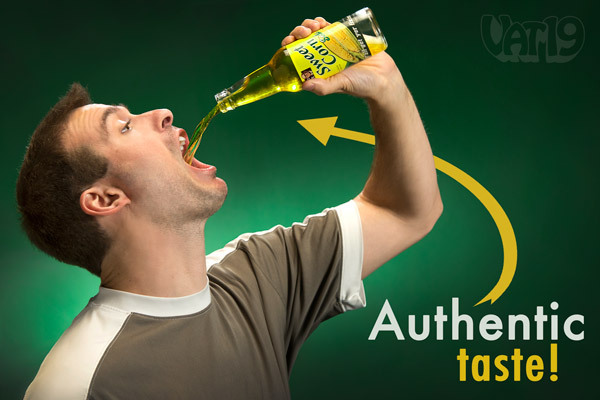 Ranch Dressing Carbonated water, sugar, sodium benzoate (preservative), gum acacia, natural flavor, ester gum. 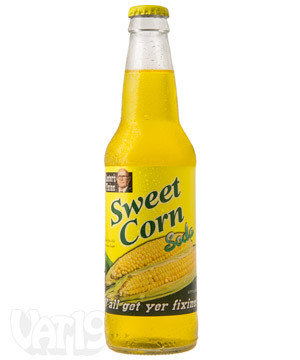 Sweet Corn Carbonated water, sugar, citric acid, sodium benzoate (preservative), natural & artificial flavor, yellow 5 & 6.